Team Bath Racing Electric (TBRe), comprising undergraduate student engineers from the University of Bath’s Faculty of Engineering & Design, will travel to Zhuhai, China, to compete at the Formula Student Electric China event, which takes place Monday 26 November to Saturday 1 December. They will arrive as the top UK electric team and sole UK representatives. It will also be the first time a UK team has competed at this event. Over the six days in Zhuhai, the University of Bath students will test themselves against over 35 teams from across world where their racing car will be put through its paces in a number of static and track-based challenges. Earlier this year, at Formula Student UK, TBRe recorded their highest ever ranking – finishing 17th out of the 129 combustion and electric teams – and retained their title as top UK electric team for a consecutive year. This is the first time TBRe have competed outside of the UK, which has been made possible through the sponsorship and support from a number of organisations and businesses. Shanghai Automotive Industry Cooperation (SAIC) Motor UK Technical Centre has been pivotal in supporting TBRe as their lead sponsor, providing engineering expertise as well as financially and logistically supporting the team in getting the racing car to China. 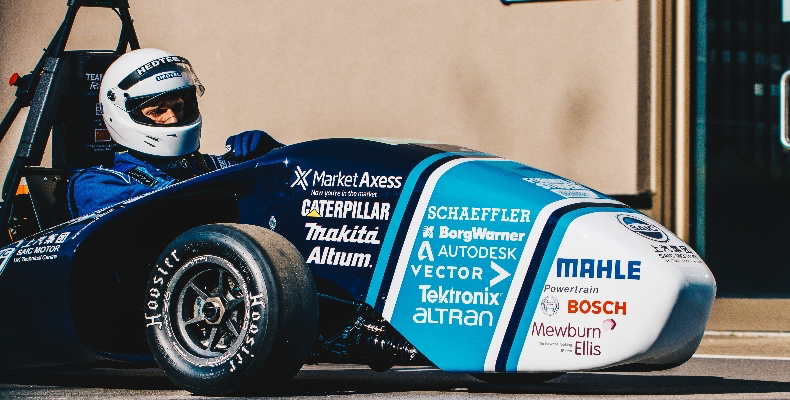 Companies such as Mahle Powertrain and Bosch have also provided their backing and sponsorship, as well as a variety of financial and in-kind support from the University’s Faculty of Engineering & Design and Development & Alumni Relations. SAIC Motor UK Technical Centre, Adam Parr, Employer Brand and Engagement Manager, added: “Over the past few years we have developed an excellent relationship with the University of Bath, employing students from their engineering faculty on our internship and graduate programmes and collaborating with them on projects. When the opportunity arose, we were delighted to provide support to TBRe with insight from our skilled engineering workforce and other logistical support. 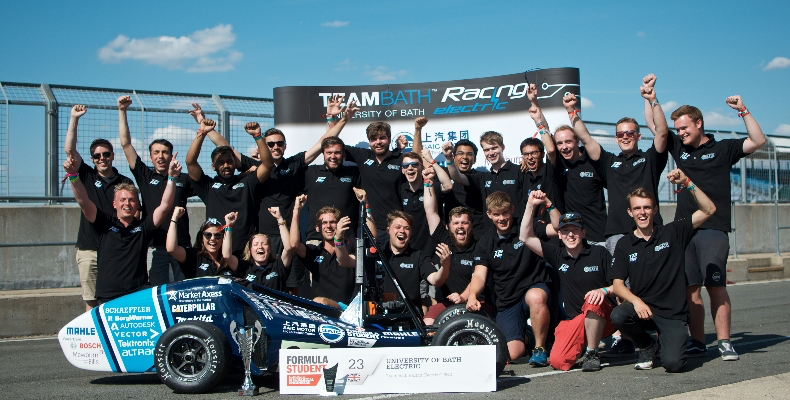 Team Bath Racing Electric (TBRe) and their combustion counterparts – Team Bath Racing (TBR) – compete annually at the Formula Student competition. This is Europe’s most established educational motorsport competition, run by the Institution of Mechanical Engineers (IMechE). Formula Student (FS) challenges student engineers to design, build and race a single-seat racing car in one year. The FS competitions scrutinise a variety of aspects of each team’s racing car, ranging from manufacturing cost and vehicle design, to on-track performance metrics such as vehicle acceleration and fuel efficiency, and ultimately race pace. This is only TBRe’s second year since forming and its early success it evidence of the strength of the University’s engineering students and degree programmes. 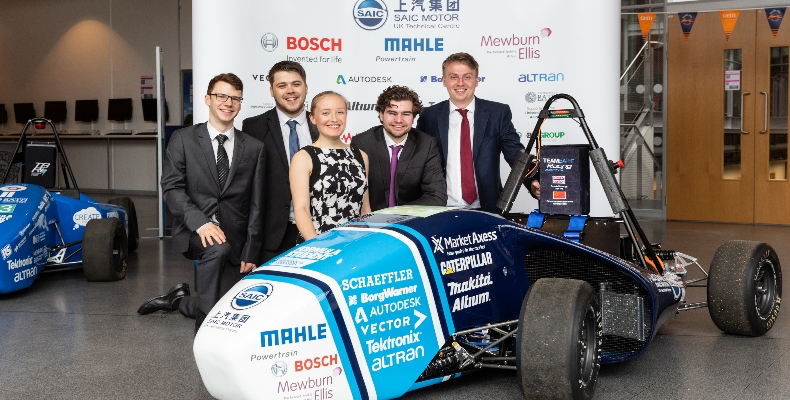 As part of their degrees, students have the opportunity to represent TBRe at Formula Student and base their final year project or dissertation on the particular aspect they have been working on as part of their role in TBRe.